What Motivates European Youth to Join ISIS? Western governments are concerned about stemming the wave of foreign fighters flocking to join ISIS’s ranks. They worry that fighters, who hold Western passports, will return to their native or adoptive lands and commit acts of terror. Some 15,000 foreign fighters are estimated to have gone to Syria.1 Of these, some 5,000 are believed to be young people of immigrant descent from European Union countries2. Bernard Cazeneuve, Frances’s Interior Minister, estimates that 36 French citizens have died fighting for ISIS and another 930 are either currently a part of ISIS or trying to join the IS effort in Syria and Iraq3. The numbers from other Western countries are also worrying: 800 from the United Kingdom, 300 from Germany. Although the media is slowly picking up on this threat, there has been little analysis or insight into the motivation of these recruits, aside from attributing some mystical marketing skills to ISIS. In fact, research suggests that there is a significant “push” factor providing a conducive context for ISIS recruitment in Europe. ISIS has been able to capitalize on the lack of social integration of young people of Muslim immigrant descent in Europe, who are often victims of discrimination and stymied from full participation in European labor markets and societies. The “elephant in the room” is in fact Europe’s inability to welcome fully and integrate its immigrant populations. The irony is that many recruits are Westernized second-generation immigrants, who grow up having a non-Western, “immigrant other” status thrust upon them. This may arise by virtue of physical characteristics such as skin color or ethnic background, or by having a name such as Mohammed or Abdoulaye, or because they practice Islam in public. The failure to integrate immigrants creates a translocal phenomenon by which individuals raised in a local context (say, a working class neighborhood in the suburbs of Paris or London) are pushed into adopting a transnational identity and association not truly their own. This explains why ISIS recruits are so varied in terms of background, culture, education, and even class. The danger of ISIS fighters returning to Europe has already been felt in France, and a recent headline in France’s leading newspaper, Le Monde, even publicly asks what the Islamic State is capable of in Europe.4 A current example of this danger can be found in the case of Mehdi Nemmouche, a 29-year-old French citizen and second-generation immigrant, who was arrested for killing three people at the Jewish Museum in Brussels in May of this year. It is believed that he fought for ISIS in Syria in 2013. Nemmouche grew up in Roubaix, a city in northeastern France with a substantial immigrant population and limited economic opportunity. His profile was by no means unusual. An immigrant mother reported that she and her family live in “another France” where they experience a lower economic level and an immigrant typecast due to their physical characteristics that mark them as outsiders.5 If one is perceived to be both Muslim and immigrant, there is a compound effect that carries a stigma resulting in an entire array of lower life chances. France represents a bellwether in its effort to integrate non-Western immigrants compared to other European countries. In October 2005, three weeks of rioting erupted within the immigrant community in the Clichy-sous-Bois suburb of Paris to demonstrate against unequal treatment. The violence spread to 300 urban areas in France and, to a lesser extent, to immigrant communities all over Western Europe. France has the largest immigrant population and the largest Muslim population proportionally and in absolute numbers in Europe. Immigration accounts for 25 percent of the annual population growth rate, and immigrants and second-generation children represent 19 percent of the total French population, or about 11.8 million people.6 Among immigrants, 67 percent come from overwhelmingly Muslim countries in North Africa, the Maghreb and Turkey, and another 20 percent come from West African countries with substantial Muslim populations.7 Muslims are estimated to be 7.5 percent of the French population today and anticipated to reach 10.3 percent by 2030.8 Overall immigrant integration, and particularly the incorporation of Muslim immigrants, remains an important challenge for French society and other European countries. Not meeting this challenge has meant recurring protests in France’s immigrant suburbs in 2006, 2007, 2009, 2011 and 2013. Although France has seen the worst of such demonstrations, other European countries generally have developed rather rigid policies as a response to Muslim immigrants’ cultural differences. As notable examples, Switzerland and Austria put laws into place since 2009 that eliminate the construction of mosques with minarets9, both France and Belgium have passed laws banning the wearing of a full-face veil in public, and at the city and regional levels in Spain, Switzerland, and Italy, laws banning face veils have been adopted. Policies such as these are both examples and symbols of hostility toward immigrants that inform a whole range of treatment and outcomes, from missed educational opportunities and joblessness to discrimination in housing. The result is that second-generation immigrants growing up culturally similar to their local French, British, or German neighbors come to inhabit a translocal space where their identities are defined not by their own assimilation or even varied immigrant roots but the expectations of the majority population treating them like a generic Muslim “other.” As an example, the Brighton, England 19-year-old black youth, Ibrahim Kamara, the son of an immigrant from Sierra Leone, joined ISIS in February 2014.10 His biography illustrates a path to recruitment that could have been diverted. He endured a childhood punctuated with racial abuse and name calling in the white-majority residential area where his mother rented their home. A product of public schools, Ibrahim struggled at school and failed from his computer engineering program in 2013. He then switched to an easier course of study that would lead to fewer career opportunities. It was in this context that he became radicalized in his local neighborhood and through ISIS internet recruitment materials. Ibrahim was killed in Syria in late September. His bewildered mother learned of his death on Facebook. I am Algerian despite my French papers; I am French despite my Algerian appearance…I was not born in Algeria, I was not brought up in Algeria, I’m not at home in Algeria (or I don’t have Algerian habits), I don’t think like an Algerian…but I feel Algerian all the same. For young people who are citizens of immigrant descent, growing up as an “other” in society, especially when combined with insults, discrimination, and joblessness, can push them to seek a home where they belong and feel respected and valued. It is in this context that ISIS finds susceptible recruits. The reasons for ISIS’s recruiting successes are likely as varied as the recruits themselves, including youth unemployment and globalization itself. But clearly many European recruits are pushed toward joining ISIS by their failure to be assimilated, accepted, and respected by their adoptive countries. The challenge for Europe going forward will be to change its treatment of immigrants even as it rightfully recognizes the danger some within those ranks pose. 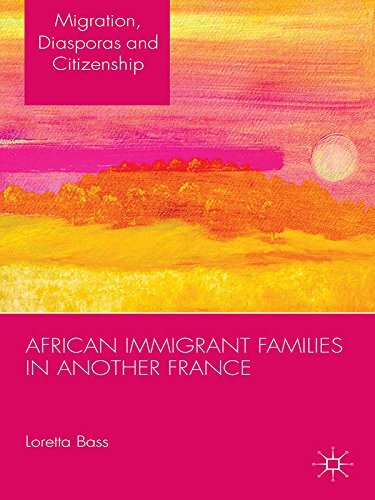 * Loretta Bass’ most recent book is, African Immigrant Families in Another France (Palgrave-Macmillan, 2014). Loretta can be contacted at: lbass@ou.edu and is presently on sabbatical in Frankfurt, Germany. The Economist. “French Jihadists Self-service,” Pp. 28-9. October 11, 2014. Bass, Loretta E., African Immigrant Families in Another France. New York: Palgrave-Macmillan. Sayad, Abdelmalek, 2004 , The Suffering of the Immigrant, English translation of A. Sayad (1999) La double absence, Malden, MA: Polity Press. Excellent article. Thank you for your insight. We understand the struggle of the immigrants descents in Europe. Here in Brazil we are very fortunate that the society is open and accepts Islam in its own way. They are 2 regions with different background and identity building, I hope we can see a better future for these immigrants in Europe. My research does not explain everything, but it provides relevant context to understand where these young people are coming from — coming of age under social exclusion and economic isolation and disillusionment. The following article seems for me, to suggest that appeal of a cult is playing a bigger role than lack of integration. What is driving French nationals to join Islamic State? In response to this BBC article, we should view it as complementary rather than contradictory to my article focusing on the push factor of being a French citizen but being treated on the subways and in the labor market as not French due to an appearance of immigrant descent. Joining Jihadi Terrorist Cells in Europe – book chapter in in Magnus Ranstorp (ed),Understanding Violent Radicalisation: Terrorist and Jihadist Movements in Europe (2009) ISBN 9780203865743, Taylor & Francis pp 87-115. Or this article from the CS Monitor by Sara Miller Llana: Why young Europeans are becoming jihadis? It is a fact well documented that second generation immigrants from France in particular have been suffering for decades from unfair treatment and alienation by their respective governments and that their socioeconomic condition is conducive to indoctrination and activism. In that respect, Loretta’s article is not contributing anything new to the reflection . It is my contention that the MSM or some so called pundits either do not mention the results of those studies previously mentioned or prefer to put more weight on one more minor sexier factor rather than the more potent ones. By avoiding to dig deeper into the reasons those young recruits tell them they’re joining the ‘global jihad’ they’re not helping us understand the societies in which we live. And as controversial as those reasons might be they deserve proper study and analysis if we want to prevent homegrown terrorism in Europe. To her credit, Sara from the CS Monitor article above mentions the “anger at the mass killing of Muslims by the Syrian regime of Bashar al-Assad” as one of the many factors that contributed to the French born citizen Salam Abdel to join the ‘jihad’ in Syria. But it is only mentioned in passing as one of the many factors contributing to Salma’s decision. The alienation experienced on a daily basis by young second generation Muslims in France is nothing new. But until 2005, their frustration had never taken a violent form. So what was the tipping point for those young recruits to abandon the comfort of their own lives for the unknown, for the unknown in a war zone with the prospect of death? It is here that I believe emotions are playing a key factor in their decision and henceforth deserve more attention. As Peter Nesser says in his study mentioned above: those idealist activists “above all, call for social and political justice and fair treatment of fellow Muslims around the world.” Through their own experience of injustice and alienation, those young European recruits can easily identify with the plight of the Syrian people. The lack of direct involvement from the world community in the human tragedy unfolding in Syria mirrors their own alienation, abandonment and injustices. Whether there is any validity in their assessment or it is a question of perception is something that ought to be addressed if we want to prevent young recruits to throw away their lives and that of countless others. I agree partly with Loretta’s article,but the blame shouldn’t be put only on the western government for not accommodating the varied cultures,she has to blame the first generation of immigrants for not trying harder raising their children in a more secular way and not looking down at the western values. I would point my fingers first at the Gulf for not allowing any other religion than Islam to be practiced and then I would move to the west,just treat the illness from its roots before spreading to the west. Your whole comment is based on the premise that any migrant should fully espouse his/her new country’s ethos, mores, culture and why not religion. However, it would be ludicrous to expect from migrants worldwide, especially economic migrants, to abandon overnight what defines them and change who they are just because they have changed places of residence. It was never a prerequisite for early European settlers in the US nor any other later immigrants from other parts of the world. I’m tempted to say that the most important requirement here in the U.S is “to live and let live”. Something the European have a hard time grasping while confronted with the building of a truly European union. You don’t have to accept the Hare Krishna customs, clothes and culinary rules. But you have to allow them to practice their faith and live their lives the way they intend to. Same goes for everyone. A Muslim woman should not have to wear a mini-skirt or bikini at the beach to feel as an integral part of the greater community in which she chose to live if she chooses not to. But she shouldn’t either prevent others to do so if they choose to . Also, your argument implies that the western values you promote would have prevented those young wannabe jihadis to join the fight in Syria. This is just plain false or flimsy at best. Data collected by the european intelligence community seem to suggest that many were ‘westernized’ and lived socially comfortable lives within their respective home countries. Within Syria herself, many who espoused more western values have also joined the global jihad fight against the Assad family. Again your argument does not hold water. And although you might wish for freedom of religion in the Gulf the way you might experience in the US or Europe, you cannot ask of your neighbors, and this globalized world Gulf countries are our neighbors, to live your life and share your values. You cannot ask your Jewish next-door neighbor to bring porc into his house just because you do eat it and find it just ‘natural’. The Gulf countries do not share our values in terms of freedom of religion. It is a fact. That does not mean we cannot find a common ground of understanding to live at peace next to each other or even together. Reality on the ground shows that the perspective of the people in the Gulf regarding freedom of religion, although different from ours, does not imply that as a Christian you are unable to practice your faith if you live there. Places of worship for Christians are many in Saudi Arabia and throughout the Middle East. For most of them, they’re not churches in the sense you have in the West. But they are true actual places of worship. You have an official cathedral in the UAE, St. Joseph’s Cathedral, Abu Dhabi-UAE and the Catholic Church of Our Lady of the Rosary Doha-Qatar . Those are just a couple of places among others just to illustrate the existence of a certain and definite freedom of religion for Christians in the Gulf. Furthermore, I do not understand your argument that allowing freedom of religion in the Gulf countries the way we have in the West would influence the mind and decision of those young Europeans going to fight in Syria? The boss of the Finnish Security Intelligence Service (Suojelupoliisi = Protection Police) said a couple of days ago in a television interview, that over 50 Finns or permanently in Finland living persons have gone in the fights in Syria/Iraq. Most of them are in the ranks of extremist groups. 6 to 8 of them have been killed in the fighting. Some of fighters are “original Finns” (no ethnic or earlier religious ties to the region), who converted to Islam (some very shortly before leaving). The police boss Antti Pelttari said that most of the recruiting and radicalization happens obviously through the net, not so much through face to face contacts. Pelttari estimated, that the danger of terrorism/violence spreading to Finland by these returning extremists is still rather low. What is a bit “amusing” that some of those from Nordic countries fighting in Syria have been paid unemployment benefits during their secret Syria visit. Why shouldn’t they get benefits to which they are entitled as citizens of Finland? To my knowledge there is no law on the books neither in Finland nor elsewhere in Europe that strips a citizen of his/her citizenship because he/she decided to join the fight in Syria. I’m aware of some lawmakers in some countries trying to pass such laws. However until now none was passed. Why going abroad to fight for certain ideals or convictions should lead to the loss of one’s citizenship if it is not directly at war with the home country? The jihadists are not fighting France, Finland or the US? They’re fighting Assad and his murderous cohorts and sometimes each other. What is the moral or legal basis for such extreme measure? The killing of a fellow citizen who is part of your own community seems to have a stronger moral basis for the loss of once’s citizenship over the killing of foreigners on foreign soil. But we don’t strip any murderer or serial killer of his citizenship or certain constitutional benefits. The Spanish Civil War seized the fears and hopes of the world. However, none of the European foreign fighters that joined the fight on Spanish soil were striped of their citizenship back home. Again, there is no evidence that such measure would deter potential young recruits to join the global jihad. Well well Crawford. Who has been speaking about stripping their citizenship? First of all to get unemployment benefits one has to be available to the local work markets in a very short notice. Every trip to foreign countries must be approved by the unemployment officials and must be a short visit (like a couple of days in Sweden), this is the law for everybody. The unemployment + other social transactions for a person are daily well over 100 euros. With that money one could live rather comfortably in a underdeveloped country like Syria. Nordic people like Finns, Danes, Swedes and Norwegians are hardly ready to finance this kind of “religious weapon tourism”. A person fighting in Syria and on the same time getting his up-keeping and most certainly getting some salary from USA and Gulf Arabs can hardly under any moral scale be seen to be unemployed in countries thousands of kilometres away. So lets not be hypocritical. In your strange moral rage Crawford you should learn to read what others write. I did not demand stripping their citizenship. Though I must confess, that I do not understand for what reason a Finnish Somali goes to “liberate” Syria but not Somalia, which has had much worse human rights and democracy problems than Syria. Neither I do not understand for what reason a “normal white” Finn converts to Islam and the next day goes to Syria to join ISIS, the beacon of democracy and human rights.